With sadness we announce that Canon Stuart Ramsden SSC died fortified by the Sacraments of the Church on 28 January 2018 in Barnsley Hospital. 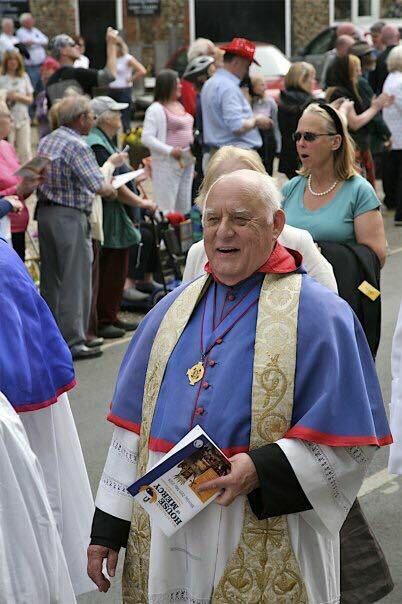 The Bishop Of Wakefield said, "Fr Stuart Ramsden was a much loved and faithful priest. He was well known and appreciated in the Wakefield and Barnsley area. For the past few months Stuart has struggled with his health. We pray for his soul now that he is at rest. May Christ welcome him to paradise! May he rest in peace." Jesu Mercy, Our Lady of Walsingham pray. The Shrine's has offered to include a catered offer so that Parishes that are new to camping would need to bring much less equipment and face a much lesser logistical challenge. This lowers the barrier considerably and should really encourage and challenge the brethren to bring their young people to the Youth Pilgrimage. The Priest Administrator needs to know likely numbers taking up the catering offer so that the Shrine may decide if it is viable or not. Brethren need to email the Priest Administrator directly by 5th February, so time is of the essence.